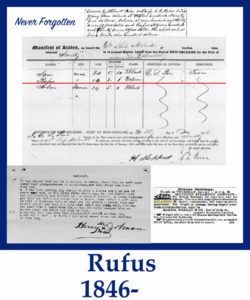 Rufus was valued at $666.00 at the age of 10 years and inherited by his deceased slaveowner's daughter Elizabeth "Adeline" Price. 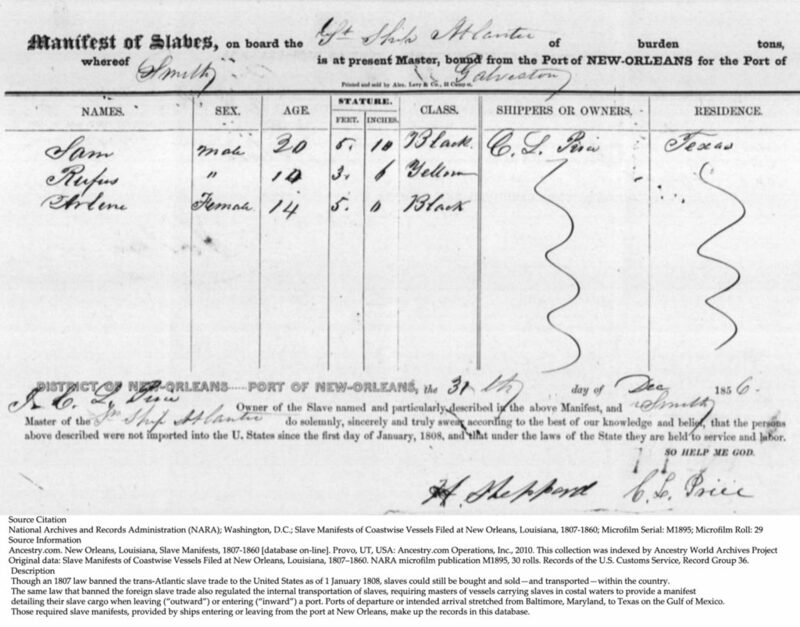 On New Year's Eve in 1856 he was carried with two other slaves by Cuthbert Lewis Price (husband of Adeline) from the Port of New Orleans to the Port of Galveston, Texas traveling to Price's Mountain in Palestine, Texas. In the new year of 1857 Rufus woke up without the love of his family in an unknown place. Please remember Rufus on New Year's Eve when you are able to call your family and wish them Happy New Year. Say a prayer that we will be able to locate his descendants and unite our family. There were many Rufus' living in Anderson County, Texas, the surrounding areas, in the US in 1866. In addition, I have possibly found Sam Price, one of the older slaves that came on the ship with Rufus. This Sam is listed as black and married in 1859 to a white daughter of a neighboring slave owner that bought Sam's freedom. They became successful and prosperous owning over 4000 acres. His descendants are working with me to verify the connection and assist in acquiring more information on Rufus. This is unconfirmed at this time. In addition, I have located a present day man who is a possible descendant of Rufus. The search goes on to reunite the family of Jack Johnson and fulfill Jack's prayer to bring all of his children (descendants) home.